chipmunk characters didn't even have names until their first meeting with Donald Duck, which came out ten months after the Gophers' first appearance, so obviously they didn't get their names from that source. And the idea of a pair of characters who look exactly alike couldn't have come from Chip 'n' Dale either, because the latter actually don't look all that similar. (Nor is the idea likely to have come from Heckle & Jeckle, who preceded the Gophers by only a few months, because of the amount of time it takes to produce an animated cartoon.) What's more, they didn't even have those individual names at first — "Mac" and "Tosh" were attached to them later, for the Bugs Bunny TV show. And they were worlds apart in characterization. Disney's Chipmunks's main trait was just that they were annoying (tho cute). 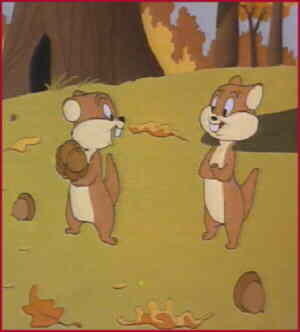 The Warner Bros. Gophers (which actually looked and acted more like squirrels) were also annoying (tho cute), but their most irritating trait was extreme politeness, whereas Chip 'n' Dale were just plain rude. The personalities of Mac 'n' Tosh harked back to cartoonist Frederick Burr Opper's Alphonse & Gaston, the overly polite Frenchmen who could never get anything done because neither would so much as walk through a door before the other. The Goofy Gophers, which was the name of the cartoon that introduced the eponymous rodents, was released on January 25, 1947. It was written by Bob Clampett, who also designed the characters, and whose place in animation history was already assured by his having created Tweety Bird, Beaky Buzzard, Warner's version of the Gremlins and many other classic characters and concepts. But Clampett left the studio before the cartoon went into production, so it was directed by Art Davis (who later directed The Ant & the Aardvark, The Pink Panther and other series for the DePatie-Freleng Studio). Later entries in the series were directed by Bob McKimson (Foghorn Leghorn, Hippety Hopper) and Friz Freleng (Yosemite Sam, Speedy Gonzales). Mac's voice was done by Mel Blanc (Marvin Martian, Secret Squirrel and so many more) and Tosh's by Stan Freberg (Joonyer of The Three Bears, Bertie of Hubie & Bertie). The Gophers were never superstars, but did appear in nine cartoons, eight in the 1940s and '50s with the last finally straggling to the screen halfway through the '60s. Three of the nine featured crossovers with other Warner characters. Bugs was in their first outing; they pestered Elmer Fudd in Pests for Guests (1955, directed by Freleng); and in their final appearance (Tease for Two, directed by McKimson and released August 28, 1965), they played against Daffy Duck. They were never comic book stars, models for plush toys, or anything like that. They've made one or two appearances after the classic era, but never as headliners. Still, their nine cartoons are part of the Looney Tunes package, which have been enjoyed by generations of TV viewers. Text ©2003-08 Donald D. Markstein. Art © Warner Bros.